Pope Francis will travel to Assisi on Sept. 20 to participate in the closing session of the World Day of Prayer for Peace. This event first took place 30 years ago, when St. John Paul II invited the leaders of the major world religions to come here to pray and fast for peace. This year’s event is organized by the Franciscan Families, the Diocese of Assisi and the Community of Sant’ Egidio, which has kept alive over the past 30 years “the spirit” of that first historic gathering on Oct. 27, 1986. Convened under the banner “Thirst for Peace: Religions and Cultures in Dialogue,” this year’s event brings together some 400 delegates from all continents and many countries. They will include leading representatives of the major world religions, including Judaism, Christianity, Islam, Buddhism, Hinduism, Sikhism and traditional religions. Among the delegates there will also be leading personalities from the social, political and cultural worlds across the globe. The ecumenical patriarch of Constantinople, Bartholomew I, a close friend of the pope, will be present, as well as the president of Italy, Sergio Mattarella. This will be Francis’ third visit to the town of the saint from whom he took his name upon his election as pope. He will participate in the closing session of a three-day event (Sept. 18-20) that includes prayers for peace, conducted according to the different religious traditions, and a discussion by the delegates present on ways to promote peace in today’s turbulent world. He is expected to reaffirm the vital contribution that different religions can make to peace in the 21st century, and their common rejection of the use of God’s name to justify violence. Over the three days participants will share their views in round-table sessions on no less than 26 different topics including religion and violence, Muslims and Christians together for peace and the mercy that transforms the world. They will also discuss other topics, including the economy and finance at the service of peace, building bridges in a “new Europe,” women and peace, how to stop wars, respond to migration and welcome migrants. In 1986, Pope John Paul II—now a saint—took the courageous decision to invite the leaders of the different world religions to come together in Assisi to fast and pray for peace at a time of increasing conflict and tension in the world. He was criticized by some for this initiative, but history shows that it had a major impact on consciences and demonstrated clearly to the world that every religion in the depths of its own tradition is committed to peace not violence and that all religions can cooperate together to building a more peaceful world. This year’s ecumenical and interreligious event comes at a time of even greater violence than in 1986, since, in the words of Pope Francis, we are witnessing “a third world war” that is “being fought in pieces,” together with the spread of blind violence and hatred—and a refugee crisis of a dimension not seen since World War II. By his decision to come here, Francis is reaffirming yet again the urgent need today for all forces in society to work together for peace, dialogue and mutual respect, and for the overcoming of confrontation and conflicts, as well as the blind violence and hatred that risks tearing the world apart. 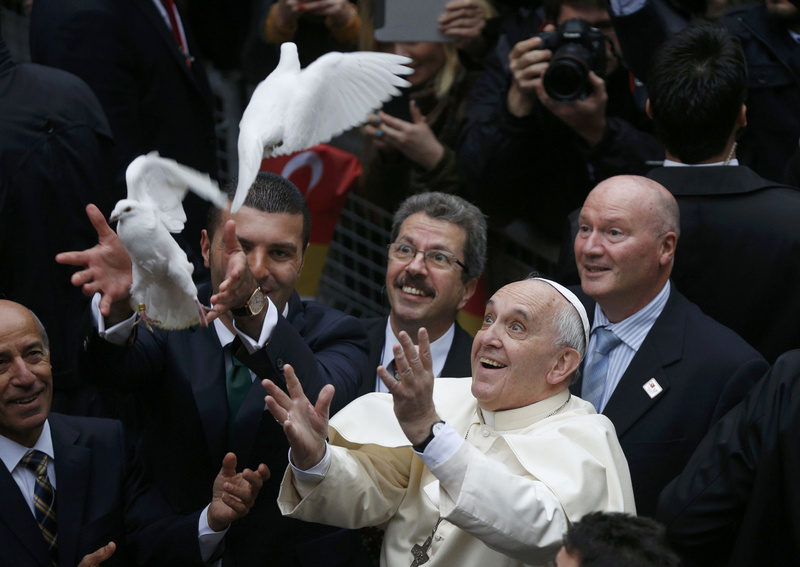 Ecumenism on peace may be the only way that the young will find hope. JPII started this initiative and Francis needs to give it a big boost. All attempts by anti-ecumenism types should be ignored or gently condemned .